Theme: Asia Time. Chairman: Luo Yiping. Chief Curators: Henk Slager, Zhang Qing. Curatorial team. The First Guangzhou Triennial, organized by the Guangdong Museum of Art, was inaugurated in November 2002 in Guangzhou City, China. Under the theme Reinterpretation: A decade of experimental Chinese art, it presented a historic review and academic interpretation of experimental Chinese art since the 1990's. The second edition in 2005 titled BEYOND: An extroardinary space of experimentation for modernization, established the Guangzhou Triennial as a regularly-held international art event. It was curated by Hou Hanru, Hans Ulrich Obrist and the Guangdong Museum's curator Guo Xiaoyan. The Third Guangzhou Triennial in 2008, with curators Gao Shiming, Sarat Maharaj and Johnson Chang Tsong-zung, had the title Farewell to Post-colonialism, which was also a theoretical basis from which it explored its critical vision. In 2012, the 4th edition proposed under The Unseen a visual journey through space and time curated by JIANG Jiehong and Jonathan Watkins in 2012. 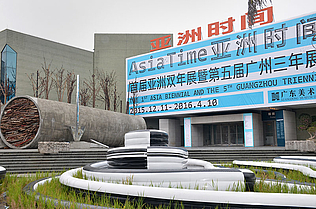 In 2015 the Guangdong Museum of Art organizes a unique combination of the Guangzhou Triennial and a new Asia Biennial, meant to become one of the largest regular art events in Asia, with an international curatorial team and artists from all over the world. This ambitious project aims to extend the topics about Asian consciousness and Asian experiences from the Asian Art Curators' Forum held by GDMOA in 2013, discussing Asian art development under a global context.